The Dairy forms part of the original Cow sheds on the farm. It boasts accommodation for up to 8 people, Upstairs there are 2 generously sized bedrooms with lots of light in the rooms (there is a restricted head height upstairs). Separate dressing / storage room. Downstairs offers a modern open plan kitchen/ diner / lounge with appliances including under counter fridge, oven, microwave and dishwasher. Lounge with ample seating, Downstairs. There is a walk in shower room. A king size Bedroom with French doors leading onto a patio area. Downstairs cloakroom. Ample parking. The Old Barn, The Granary and The Dairy are complete but the other properties within Bramble Farm Cottages courtyard are in the process of refurbishment and as such there may be building materials around the yard outside of the fenced area of The Old Barn, The Granary and The Dairy. 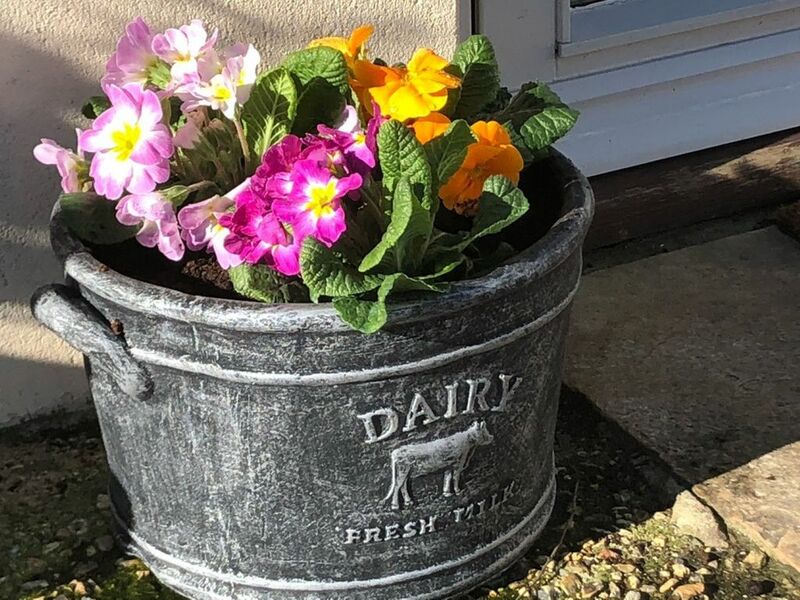 Bramble Farm Cottages are positioned within a mile radius of Bournemouth Airport so please expect some aircraft noise.Bramble Farm Cottages is a family run business which consists of old farm buildings that were part of Bramble Farm. Our cottages: The Old Barn, The Granary, The Dairy, The Milk Churn and The Stable are five converted buildings which are part of the Old Farm House in Church Lane. They were built in the 1820s and were in active use as farm buildings until 1995. It was at this time the old buildings were made redundant and the Farm changed from Dairy to Beef livestock. The old Dairy buildings were no longer required for farming and so since then, have been converted into cottages, although retain alot of the original character of Bramble Farm. Each cottage has its own individual style and charm. Our aim is to provide you with a superior level of comfort that will enable you to relax, unwind and enjoy the wonderful opportunities that a holiday in beautiful West Parley can provide. Although the original farm courtyard has been converted the fields and livestock barn are very much a working farm. We have worked hard to ensure that our holiday cottages and facilities are excellently equipped, cosy and give you a home from home feel providing you with a holiday you will never forget. We offer short breaks in most of the holiday cottages all year round and provide highchairs and cots if required. We regret that we do not take dogs or other pets and all holiday cottages are for non-smokers. The Dairy was very spacious, with every home. comfort catered for. Matt popped in to check everything was ok for us, and when i asked if they had a bigger travel cot available, he made sure he was able to provide one by the time we came home from our day trip. Would love to go back and stay therr again. Very clean and ideal set up with renting 2 of the other houses. We stayed here as our daughter got married and the reception was at Parley Manner. Simply superb in every way. Barn conversation was of good specification, very clean, spacious with an open plan kitchen, dining and living area. Ground floor bedroom and walk in shower room was ideal for mother in law. Two ground floor toilets. Upper bedrooms ok, hanging rails for clothes and head room in centre of the apex roof Ok even for my tall son at 6'4" but had to be careful under the apex of the roof where beds are located. Games room on upper floor. Internet connection very good for the devices we used. Once we got access to the self contained two floor flat, we were very impressed by its high quality fittings, the space and the children's playroom situated through the 4 bed children's bedroom. In fact, once they were all there,we lost them for a good three hours, on the first night....marvellous! The open aspect to the rear came in handy for deer, bird and horse spotting, as well as an Easter egg hunt. Lots to do in the area, beaches were fun even though the weather was bracing. The four nights went quickly, two nights cooking, two nights buying in, with lots of choice locally, a 10 minute walk across fields. The children only asked for the television, a 40 inch job, once, on the final night, when we made use of a video provided, along with children's games and toys, by the owners. Parents and grand parents slept soundly, though some noise from the next door flat was heard.